I suffer a little bit from Knitter ADHD - also know as the Ooh, Shinny new thing! Syndrome. Now I know this about myself and so I know I need to restrain my impulses or I end up with no needles left to use, a million new cast-ons, piles of WIPs and UFOs cluttering up the house and nothing actually ever getting finished. For me, I find I need to periodically drop the needles, back off from the actual knitting and stock-take and plan. The beginning of a new year is a great time for this. I did make some New Years Resolutions for 2015. (But they are mostly about my knitting and they are more in the light of challenges I have set myself. On a more personal reinvention to a healthier me note, I also gave up sugar in my tea. That's a real challenge!) I'm sharing them here with you as a form of self motivation and type of self shaming.... If I proclaim it to the world, I'm more likely to follow through aren't I? All good efforts start with good planning…. I want 2015 to be as awesome a knitting year as 2014 was! Knit up the four jumper lots of yarn that are yelling to be done this year. Find and queue patterns for said jumper lots - One cable for me, one classic cardigan for the boy, a self designed kimono with an asymmetric front, and a self designed garter stitch jumper in a chunky boucle. Apply my free forming skills to the swatch collection - I’m thinking they become a basket. At least one pair of socks this year. Charity knitting that actually gets donated to charity - I tend to need to knit toys on a regular basis - also hats but hoard them. Put the practical bits of the stash on Ravelry - garment and accessory sized batches that are labelled. Buy and knit at least one dream pattern from the queue. Seriously cull the magazine collection - this is my current January summer holiday project… (I also like idea of a long term plan to knit a project from each book/ magazine I own!) Once done stick more of the library on Ravelry. Play along in the useful Rav activities that make me knit productively - COM (Cast on Month in Village Hopelessly Overcommitted) and regular WIP wrestling bouts as well as NaKniSweMo. Try to keep the ratio of Cast ons to WIPs completed at less than 1:1. Finish at least three long term WIPs in 2015. This looks like a lot but I knit every day so a need a decently ambitious plan. And I signed up to Cold Sheep (go a whole year without buying any yarn) after a small final fling in early January - 8 mixed balls of browns and greys to have enough to finish Granny wants a latte macchiato and one ball of variegated red for a charity project. And I walked past my favorite op-shop and a sweater weight quantity of delicious dark blue grey sport weight just asked me for a new home at a ridiculous price. I really, really do have enough yarn to knit from for a whole year and not run out. I do! Yarn to finish already started projects. Yarn for commissioned projects. (Though the other person can supply this). A free pass for Craft Shows and road trip yarns - but a serious budget limit to be applied here. Shopping my mother’s stash is always allowed. I'm only including the stuff on Ravelry - There are a couple of very old UFOs that haven’t made it to Ravelry yet but they are not on the radar this year. UFOs (I have to really go digging to unearth these. They are in deep storage. There are only eight though). Domino Shawl - has a chance at life soon - I know where it is at least…. Gentlemans sampler afghan - next long term knit afghan project - plan devised as part of January 2015 stocktake process. Longitudinal - damn second sock syndrome. Of mice and mushrooms - self designed cardigan suffering for a lack of yarn to completely execute plan. A lovely fellow Raveller is sending me 4 balls of yarn so I can execute the original plan…. Order of the Garter - what project? - this is yarn with a plan. WIPs (Have received recent love. Not in the rotation at the moment though. Only five of these). 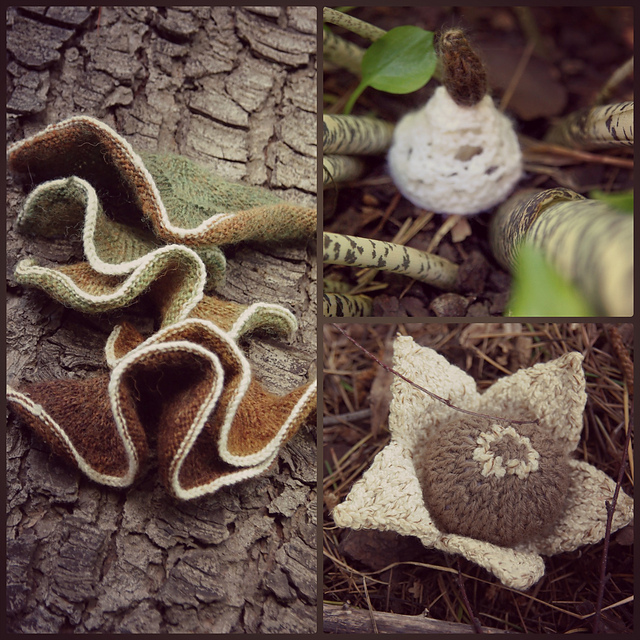 Fungus among us - Want to make more fungi and lichen. Have patterns ready. Monochrome - freeform exploration piece. Being added too as inspiration strikes. Pallina di natale - one down - lots more to make. Christmas baubles for my daughter’s tree. Little diversions that only take a day or so. The Christmas goat is next. To tag an owl - Little crocheted owl tags /ornaments - want to make a few more out of the oddments. Planned small diversions. Current WIPs (I’m not a monongamous knitter. Four at a time is pretty standard). Anyone got Cable! - the scarf afghan - one scarf to go. Pattern and yarn picked - will be next new project on the needles this month. Granny wants a latte macchiato - long term granny rug that has just been assembled so far and the crochet hook is out and I am making new squares. About 1/3 finished. It will be queen bed sized…. Swatch buster - free form C/KAL for Jan / Feb 2015. Theme: Polar opposites. Aim: To cover my work tub with all those pesky swatches. 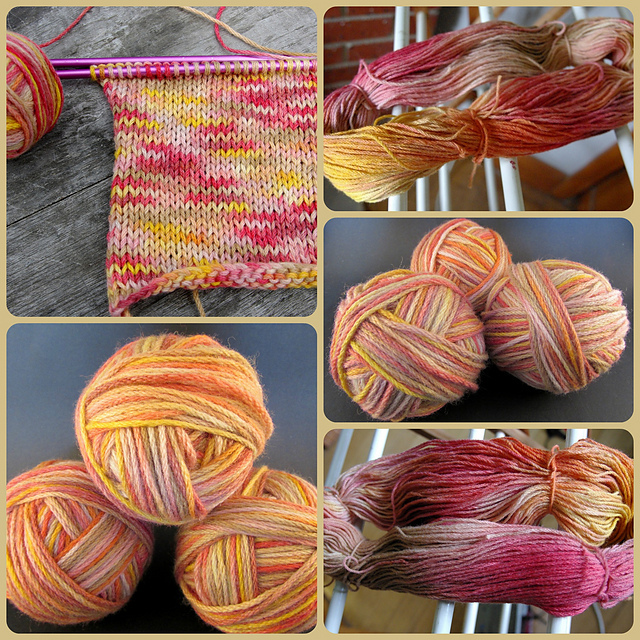 Sunrise / sunset - We hand dyed the yarn, we have a plan. Next to the needles. This is typical me. It's nearly the end of January and we're only just letting the plans out in public. The good thing about the delay is that I can report on the progress as well! Added all the magazines and knitting books that I located to my Ravelry library. (And earmarked about 6 or 7 magazines for sale / trade) (Serious Progress on Resolution #8). 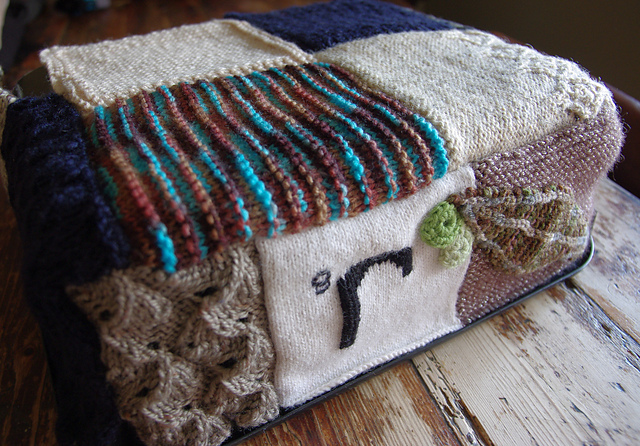 Joined a couple of new Stash busting / Finish a thing and Cold sheep groups on Ravelry. You need your support mechanisms and these types of groups are wonderful. Tried to fit plans to yarn - queued a few patterns, swatched a bit, etc... (This is the subject of next blogpost). (Resolution #2 seriously underway). Decided on a hastag for the year #Stashtosweater. Began wrestling those swatches into a recognizable project form. (Resolution #3 is source of great current enjoyment and knitting challenge).